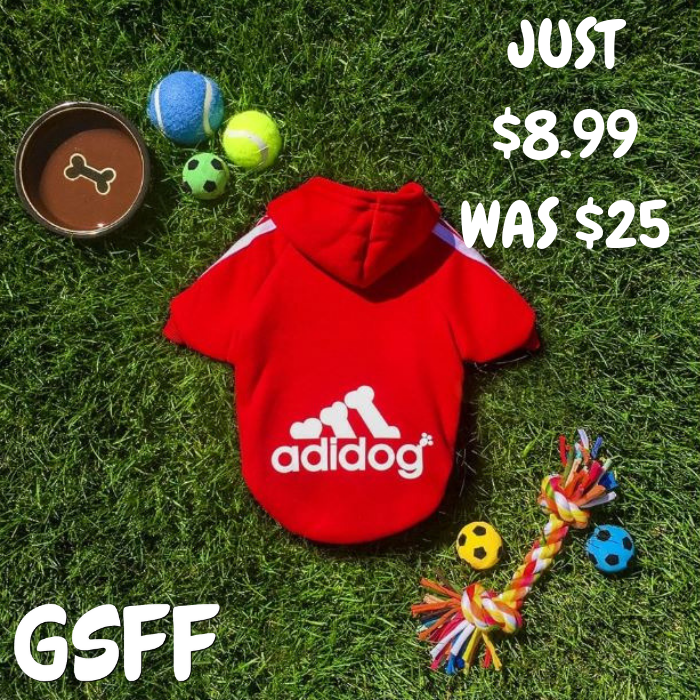 Pet Sports Hoodie Just $8.99! Down From $25! Shipped! You are here: Home / Great Deals / Pet Sports Hoodie Just $8.99! Down From $25! Shipped! Until November 28 only! Jane has this Pet Sports Hoodie on sale for just $8.99 down from $24.99 PLUS FREE shipping! Your search for the perfect pet hoodie is over. The Adidog Sports Hoodie is guaranteed to be your pet’s favorite winter wardrobe item to keep them feeling warm and looking great! These hoodies have a nice substantial feel and are simultaneously soft and sturdy. The Cotton fabric won’t fade or shrink and has a nice amount of stretch to it to suit even hard-to-fit pet body styles. Pets will enjoy wearing our hoodies both inside and out. They are a great choice for crisp fall days, cool evenings, or chilly spring days. The Adidog Sports Hoodies are designed with a high-cut belly to allow your dog or cat to take care of those bathroom duties without soiling their garment. This ensures that they can stay warm at all time. The hood provides extra warmth around the neck area, even when it isn’t being worn on the head.